A magnetic spinning top is an exciting toy that combines several physical principles. You've been able to buy them for a few years now, and I've always been fascinated by them. I've searched the Internet - without success - for exact construction guidelines on how to make such a magnetic spinning top at home. Here, I provide my own instructions downloadable as a pdf. Supermagnete.de publishes below a heavily abbreviated version. Here is a video of a customer who successfully reproduced this magnetic spinning top with our magnets. He confirms, however, that it was not easy to do and took many tries until the spinning top floated so steadily. I tried to use low-cost or recycled materials - only the magnets are not your typical household items. Note from the supermagnete team: If you don't have an old loudspeaker handy, you can try our ferrite ring FE-R-100-60-20 that has a comparable size. We have received feedback from customers that the spinning top should be heavier in this case than in the original experiment. Unfortunately, we are not able to give you any more details on that, but we hope that you have enough intuition and patience to get the spinning top to float. 1. Cut a straight 5 mm thick piece from the cork. 2. Place the ring magnet on the cork and mark the inner diameter and the center with a pen (dividers might be helpful). 3. Drill through the center of the cork with a wood drill. 4. Cut the cork to the marked size. The cork should now weigh about 0,4 grammes. 5. Glue the cork disc to the ring magnet. 6. With a saw, cut the plastic screw to approx. 40 mm length. 7. Cut off the screw head as well. 8. Apply some grooves to the plastic screw (also with a saw or a grinder). 9. Round off the end of the screw with sandpaper. This end will be the tip of the spinner. 10. Weigh the screw; it should weigh about 0,7 grammes. Shorten the screw if necessary. 11. Carefully twist the screw into the cork disc. 12. Weigh the finished spinning top; it should weigh about 15 grammes. The weight of the spinner is very important for the success of this application. The weight needs to be adjusted to the strength of the round base. If necessary, you can make the spinner heavier by glueing plastic or brass discs on it. 1. Carefully remove the large ferrite magnet from the old speaker. Remove all the screws. If necessary, soldered metal pieces need to be removed. Alternatively: Buy a ferrite ring magnet directly at supermagnete.de (see note above). 2. Prepare a flat surface (check with mechanic's level). 3. Place the shoe box on 5 CD sleeves on the left and the right respectively. 4. 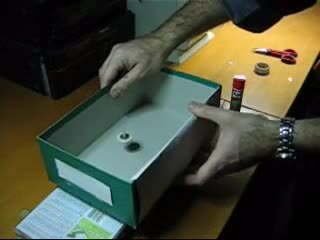 Place the ferrite magnet under the shoe box. When you move the spinner in the shoe box, at a certain point, you'll feel the power of the two combined magnetic fields. The spinning top will try to break away to the side. Hold it firmly and keep moving it around slowly until it is slightly pulled towards the base. This is the right spot to start the spinning. Give it a good spin. The spinning top doesn't gain momentum: The two magnets are too close to each other; the shoe box needs to be propped up higher. The spinning top doesn't lift up at all: The two magnets are too far apart; the shoe box needs to be lowered a bit. The spinning top doesn't lift up and turns to the side: The ferrite base doesn't lie totally flat; small wedges need to be applied to even it out. The spinning top lifts up, but moves to the side and drops down: The spinner is too light; additional plastic or brass discs need to be attached (see picture below). David illustrates these points well in the YouTube video. When the spinning top spins fast, you can slowly and carefully remove the shoe box without touching the spinner. With a little bit of luck, the spinning top can levitate for over a minute, which the video (at the beginning of the project) proves!